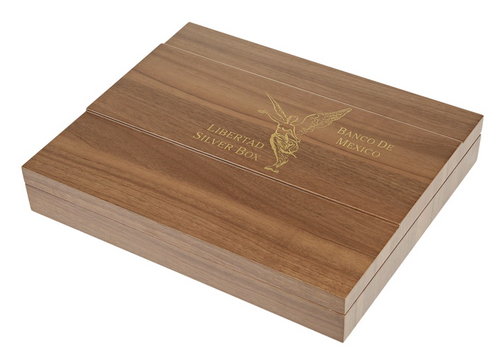 This exquisite wooden box was designed specifically for the 1oz silver coins of the Libertad series and provides an ideal storage space for your collectibles. The inserts have enoug space for coins to be put in including capsules. The box is made of sturdy wood and is additionally coated with a special varnish. In this way it provides even more comfort and quality than traditional models because of its high quality materials. The box offers space for 2 inserts for 20 x 1oz or 8 x 5oz silver coins. Thanks to the build in grips the coins and the inlays can be removed easily. The inside is internally lined with soft black velvet which suitably handles the coins carefull. The cover has a magnetic well-sealed lid which can be opened with low pressure. This stylish coin box allows you to store your treasures in an elegant way and to showcase them. Please note that this item does not include any inserts. These will have to be ordered seperately here.